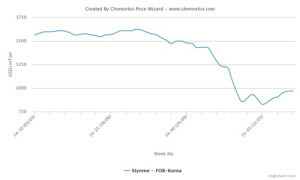 In Asia, spot styrene prices have been following an upward trend since mid January when the market hit the bottom after it had decreased for around six months in the face of plunging energy costs, according to ChemOrbis.The recent upturn in spot styrene prices is currently supported by several plant shutdowns in the region, which have created some concerns about tight availability for the near term. 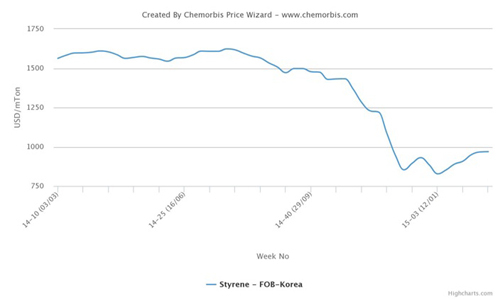 According to data from ChemOrbis Price Index, spot styrene prices on an FOB South Korea basis have increased around $140/ton since mid January while they climbed around $60/ton when compared to initial February levels. In South Korea, SK Global Chemical shut their 350,000 tons/year styrene monomer plant in August 2014 while the company is not planning to restart their plant located in Ulsan in 2015 unless their margins improve. Another Korean producer, LG Chem, is planning to shut their styrene plant for a planned maintenance at the end of March. The 500,000 tons/year plant is expected to be restarted at the end of April 2015. Meanwhile, Samsung Total is planning to conduct a one-month long expansion project at their smaller unit in Daesan in April 2015. The plant is currently able to produce 280,000 tons/year of styrene. Once the expansion project is completed, its production capacity is expected to reach 400,000 tons/year. In Taiwan, Styrene Monomer shut their 160,000 tons/year styrene plant on September 16, 2014 due to technical issues. The company decided to extend their shutdown from November 2014 to the second quarter of 2015. The producer, meanwhile, is planning to conduct a maintenance shutdown at their Kaohsiung unit in August 2015. The unit can produce 180,000 tons/year of styrene. Japan’s Idemitsu Kosan is planning to shut their 210,000 tons/year Chiba styrene plant for maintenance in April. The plant is planned to remain offline for 90 days. Meanwhile, in China, Jiangsu Leasty shut their 420,000 tons/year styrene plant in the first half of January. The plant is scheduled to be restarted in February.